These cookies use 1/2 the fat of regular chocolate chip cookies and you can't tell an ounce of difference. They are soft in the middle if you don't over bake and they literally melt in your mouth. These cookies are a must; Trust me you won't regret it. Pre-heat oven to 375 degrees. In a large bowl mix sugars, margarine, vanilla and egg white. Stir in flour, baking soda and salt. Stir in chocolate chips. Drop dough by using a rounded teaspoon about 2 inches apart on an un-greased cookie sheet (You can also use an air bake cookie sheet with parchment paper.) 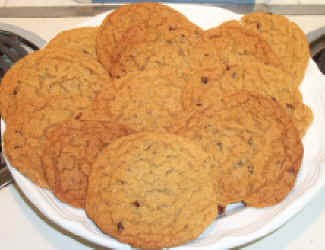 You can make the cookies larger but don't forget the fat grams will increase. Bake 8 to 10 minutes or until golden brown. Tip: To get soft centered cookies, don't over bake. After you take cookies out of the oven they still continue to bake on the cookie sheet for about 1-2 minutes. I always take my cookies out when the middle of the cookie is almost done but not completely, this allows the middle to fall and stay soft.